Jumble times are here again! If you have the urge to declutter, then go for it, because in less than 2 weeks, our Spring Jumble sale will be held on Saturday 10th March at 11am! Bags2School bags for donations will go out in school bags very soon – look out for them! And donations can be dropped at the front entrance from Monday 5th March. All donations of clean, good quality clothes, shoes, books, toys, baby items, school uniform, DVDs & CDs, bric-a-brac, jewellery etc gratefully received! Please note we can’t accept electrical items or videos. 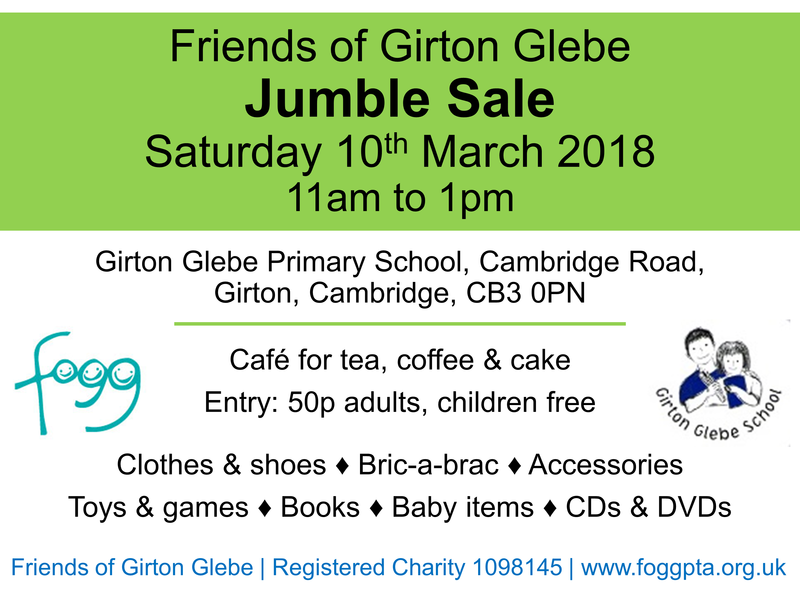 The jumble sales are brilliant fundraisers for our school, so we need as many hands as poss to sort, sell and also very importantly tidy and disperse of the remaining jumble at the end of the sale. We sort the jumble on Friday 9th March in the hall after school. There will be be refreshments for anyone who helps, plus the children can watch a dvd to keep them entertained – it’s usually a fun event for all. Please come and help your school!